"Where is My Vote?" - Iranian people Freedom Uprising! WASHINGTON, March 28 (UPI) -- Iran leads the way in the "worrying upsurge" in the number of executions in the Middle East and Asia, Amnesty International claims. The United Nations last week voted to appoint a special human rights envoy to monitor the situation in Iran. Amnesty International said Iran carried out 252 executions in 2010, compared with 18 in Libya. "Iran, Libya and Yemen experienced a worrying upsurge in executions . and there are fears of mass executions in Libya as the (current) conflict there deepens," the watchdog group added. U.S. Ambassador Eileen Donahoe in a statement last week said Washington was "gravely concerned" about deteriorating human rights conditions in Iran. She said the situation in Iran since September "had worsened" amid reports of "acts of torture carried out by the government of the Islamic republic of Iran and death sentences of men and women by stoning." Amnesty International said in many countries, executions are carried out following "unfair" trials and for relatively minor offenses like drug-trafficking or adultery. The watchdog group said more than 30 countries moved against capital punishment during the past 10 years, though Iran, Yemen, Saudi Arabia, the United States and China carried out the most executions, often "in direct contradiction of international human rights law." محمود احمدی نژاد، رئیس جمهوری ایران در مصاحبه با تلویزیون دولتی اسپانیا گفت که حکومت ایران هرگز مخالفان سیاسی را سرکوب نکرده است و او خود هفته ای چهار ساعت در خیابان ها با مردم گفت و گو می کند. به گزارش خبرگزاری فرانسه، آقای احمدی نژاد روز سه شنبه ۲۴ اسفند (۱۵ مارس) در پاسخ به سئوال خبرنگار تلویزیون اسپانیا در مورد "سرکوب معترضان" در ایران گفت: "هرگز، هرگز. ما هیچ وقت این کار را نکرده ایم. در سی سال گذشته سی انتخابات آزاد داشته ایم". آقای احمدی نژاد گفت که در همه کشورها مخالف وجود دارد، اما قانون هم وجود دارد و مخالفان نمی توانند قانون شکنی کنند. آقای احمدی نژاد گفت که آنها قانون را نقض کرده اند و با آنها برخورد قانونی شده است. آقایان کروبی و موسوی به همراه همسران خود از روز ۲۵ بهمن در حصر خانگی به سر می برند و در این مدت خبرهای ضد و نقیضی از انتقال آنها به مکانی نامعلوم منتشر شده است. آقای احمدی نژاد در ادامه مصاحبه با تلویزیون اسپانیا گفت: "بگذارید خیالتان را راحت کنم. این بازی ای که اروپایی ها و آمریکایی ها علیه دولت های مستقل راه انداخته اند که عده ای را به نام دموکراسی علیه آنها تحریک کنند، به پایان رسیده است". آقای احمدی نژاد در بخش دیگری از سخنانش، با اشاره به تجربه افغانستان و عراق هشدار داد که مداخله نظامی احتمالی غرب در مناقشه لیبی اوضاع این کشور را وخیم تر خواهد کرد. او گفت: "امیدوارم که دولت های اروپایی و آمریکا در امور این منطقه دخالت نکنند و اجازه بدهند که مردم منطقه خود در مورد آینده شان تصمیم بگیرند". رئیس جمهوری ایران همچنین اقدام معمر قذافی، رهبر لیبی در سرکوب مخالفان خود با توسل به نیروی نظامی را محکوم کرد. Iran's Islamic regime is using "child soldiers" to suppress anti-government demonstrations, a tactic that could breach international law forbidding the use of underage combatants, human rights activists have told the Observer. The International Campaign for Human Rights in Iran says troops aged between 14 and 16 have been armed with batons, clubs and air guns and ordered to attack demonstrators who have tried to gather in Tehran. The youths . apparently recruited from rural areas . are being deployed in regular riot police roles and comprise up to one-third of the total force, according to witnesses. One middle-aged woman, who said she was attacked by the youths, reported that some were as young as 12 and were possibly prepubescent. They had rural accents, which indicated they had been brought in from villages far from Tehran, she said. Some told her they had been attracted by the promise of chelo kebab dinners, one of Iran's national dishes. "It's really a violation of international law. It's no different than child soldiers, which is the custom in many zones of conflict," said Hadi Ghaemi, the campaign's executive director. "They are being recruited into being part of the conflict and armed for it." The UN convention on the rights of the child requires states to take "all feasible measures to ensure that persons who have not attained the age of 15 years do not take a direct part in hostilities". The allegation comes amid efforts by Iran's opposition Green movement to revive the mass protests that challenged President Mahmoud Ahmadinejad's re-election in 2009, which opponents say was rigged. Drawing encouragement from the uprisings in Egypt and Tunisia, organisers have vowed to stage demonstrations every Tuesday. Protesters who gathered on 1 March and a week later were met by a blanket security presence, which activists say refined the tactics used to crush the post-election revolt, when smaller detachments of youths were used informally by the hardline Basij militia. Last Tuesday youthful riot squads formed along Valiasr Street, Tehran's central thoroughfare, and forced pedestrians to run an intimidating gauntlet. Protesters chanting anti-government slogans were attacked. Multiple arrests were reported. "They are very keen to display violence. Teenage boys are notorious for that," said Ghaemi. "They are being used to ensure there is a good ratio of government forces to protesters and because the average policeman in Tehran could have some kind of family connection to the people they have to beat up. It's a classic tactic to bring people from outside, because they have no sense of sympathy for city dwellers." The renewed clampdown coincides with concern over the whereabouts of the Green movement's nominal leaders, Mir Hossein Mousavi and Mehdi Karroubi. Both were apparently placed under house arrest last month and then reported to have been taken into detention, despite official denials. - Robert Tait is a senior correspondent for RFE/RL and a former Tehran correspondent for the Observer. PARIS (Reuters) . An Iranian diplomat who defected last month said on Tuesday that Iran's leaders would rather "slaughter" their own people than surrender power to any popular revolt inspired by uprisings across the Arab world. Ahmed Maleki, who was vice consul of Iran's consulate in Milan before fleeing to Paris with his family last month, is the latest in a string of officials to defect from the Islamic state and join a year-old opposition group called the Green Wave. He said in an interview that Iranians had been inspired by images of popular revolt in North Africa but faced a regime far more brutal than those of Egypt, Tunisia or even Libya. "In the course of the past 32 years the sole objective of the regime has been to retain power," he told Reuters at a prestigious hotel in Paris, speaking through an interpreter. "They are willing to ... resort to whatever measure, including slaughter and bloodshed to the extreme in order to retain power." Two people were killed and dozens arrested on February 14 when thousands of opposition supporters in Tehran and other cities took to the streets in sympathy with uprisings that toppled the leaders of Egypt and Tunisia. Iran's Islamist leaders, seeking to avoid a revival of mass rallies that erupted after 2009 elections, have warned that any illegal gatherings by the opposition would be confronted. Maleki said many other Iranian diplomats and military officers shared his critical point of view on the Tehran government but were waiting for the right time to switch sides. He said he had fought for his country for 77 months in the 1980-88 Iran-Iraq War. Maleki joins a former Iranian consul to Norway, an air force officer and a general who have already defected to the Green Wave. It was founded in March 2010 by exiled Iranian businessman Amir Jahanchahi, who aims to disrupt Iran's vital energy sector to put pressure on Iranian leaders. TEHRAN (Reuters) . Iran's opposition said at least 79 people were arrested at protest rallies on Tuesday that the government denied had taken place at all. Authorities have deployed large numbers of security forces to prevent any repeat of the massive unrest that followed hardline President Mahmoud Ahmadinejad's 2009 re-election, and on Wednesday state media made no mention of Tuesday's rallies. Opposition websites said thousands of people demonstrated in Tehran and other cities to demand the release of "Green movement" leaders Mirhossein Mousavi and Mehdi Karoubi who they believe were taken from their homes last week and jailed. Prosecutor-General Gholamhossein Mohseni-Ejei denied the arrests, saying both men were still in their homes but were being prevented from communicating with the outside world. According to opposition website Sahamnews, at least 79 people were arrested on Tuesday. Sites said some 1,500 were arrested on February 14 during the Green movement's first rally in more than a year, which was called to show support for pro-democracy uprisings in North Africa. The police said "dozens" of people were arrested on February 14, and a parliamentary committee set up to investigate the events said only small groups of trouble-makers turned up. Talking of events on Tuesday, Tehran prosecutor Abbas Jafari Dolatabadi told reporters: "A limited number of people, influenced by anti-revolutionary groups, were intending to do something." "No specific incident happened on Tuesday in Tehran," he said, according to the semi-official Fars news agency. Dolatabadi declined to give the number of arrests. Despite the official line that there has been no significant resurgence of the Green movement, which the government considers to be a seditious plot guided by its Western foes, parliament has called for Mousavi and Karoubi to be tried and hanged. Two people were shot dead on February 14, deaths that each side has blamed on the other. The parliamentary report, issued on Wednesday, accused Mousavi and Karoubi of staging the February 14 rally at the encouragement of U.S., British and Israeli intelligence. "Foreign intelligence services had contacts with the sedition leaders urging them to call for a rally in support of popular uprising in Egypt and Tunisia ... as a pretext to create tension in the country," said the report, according to the official IRNA news agency. Opposition leaders deny such accusations. Iranian government leaders have hailed uprisings in several Arab states as part of an "Islamic awakening" inspired by the 1979 revolution which ousted the Western-backed Shah. Analysts outside Iran say the uprisings have been overwhelmingly secular, not religious, in nature. The Iranian opposition took those pro-democracy protests as inspiration to stage its own first significant show of vitality since December 2009 street protests, which were crushed by the elite Revolutionary Guards. Mousavi and Karoubi -- reformists who lost to Ahmadinejad in the June 2009 election -- were held in their homes, incommunicado, after they called for the rally. Authorities warned such "illegal" gatherings would not be tolerated. Opposition website Kaleme said it believed Mousavi and Karoubi and their wives were secretly whisked from their homes last Thursday and taken to Heshmatiyeh prison in Tehran. police have fired tear gas to disperse opposition supporters mounting protests in the capital Tehran. A BBC correspondent in Tehran said large numbers of riot police and militia on motorcycles in the city centre broke up any crowds that formed. The unrest comes a day after websites close to opposition leaders Mir Hossein Mousavi and Mehdi Karroubi said they had been jailed. The government has denied this, saying the two men were at home. The BBC's Mohsen Agsari in Tehran said by early evening the security forces appeared to have full control of the streets. The Basiji militia were chanting victory slogans, he said. Earlier, despite the presence of security forces in Tehran's main streets and squares, sporadic gatherings were held close to the main Azadi square, our correspondent said. Demonstrators chanting "Ya Hossein, Mir Hossein" were immediately attacked by the police. Both Mr Mousavi and Mr Karroubi have called for demonstrations in Iran in the light of the recent uprisings in Tunisia and in Egypt. Earlier this month the two men, along with their wives, were detained in their respective homes in Tehran as protests were staged. Thousands of their supporters took to the streets of Tehran on 14 February, amid clashes with security forces which left two dead. On Monday one of Mr Karroubi's sons told the BBC Persian service he had been told his father had been "taken by security forces to an unspecified location". The semi-official news agency Isna quoted state prosecutor Gholam Hossein Mohseni Ejehei on Monday as saying that Mr Mousavi and Mr Karroubi were not detained. The two men ran as opposition candidates in the disputed June 2009 presidential election. Mr Mousavi said he was the actual winner and President Mahmoud Ahmadinejad was only re-elected through a rigged vote. Hundreds of thousands of opposition supporters then took part in marches that were violently broken up by the security forces, including the Basij militia on motorcycles. March 1 (Bloomberg) -- Iran rejected outside criticism of its handling of the opposition after reports that two prominent dissidents had been arrested. These are internal affairs and no country has the right to interfere,. Ramin Mehmanparast, Foreign Ministry spokesman, told reporters in Tehran today in comments aired live by state television. He was replying to a question about the reported detention of Mir-Hossein Mousavi and Mehdi Karrubi. Mehmanparast, who didn.t mention the whereabouts of the two opposition leaders, spoke before an anti-government march in Tehran. The rally led to clashes between marchers and security forces, the Associated Press cited the opposition as saying. Police used tear gas and batons to disperse protesters demanding the opposition leaders. release, with several people arrested, the AP reported, citing witnesses and opposition websites. U.K. Foreign Secretary William Hague today urged the government to release Mousavi and Karrubi, according to an e- mailed statement from the Foreign Office in London. The German government is disturbed about reports of the treatment of opposition leaders and called on Iran to stop intimidation of political opponents, Steffen Seibert, chief spokesman for Chancellor Angela Merkel, said yesterday. U.S. Secretary of State Hillary Clinton also criticized Iran yesterday for pursuing policies of .tyranny at home.. The crackdown on Karrubi and Mousavi, who challenged President Mahmoud Ahmadinejad in the June 2009 election, is aimed at stemming a revival of dissent in Iran as unrest roils the Middle East and North Africa. After Ahmadinejad.s re- election, Iran was rocked by the biggest protests seen in the country since the 1979 Islamic Revolution as the opposition alleged his victory was rigged. Karrubi and Mousavi, who had been under house arrest since mid-February, were transferred to a Tehran prison, Mousavi.s website, Kaleme, said yesterday. The men and their wives were arrested and taken to Heshmatiyeh prison, according to Kaleme, which cited their neighbors. Reports of their arrest were rejected by an unidentified judicial official cited by the state-run Fars news agency. Mehmanparast said the West must .hear and respect the voice of the majority of Iranians,. who support the government and its policies, and not .divert the attention to a few people in the streets..
"God is great" and "Death to the dictator" were chanted from some rooftops in northern Tehran yesterday at about 10 p.m. local time. The slogans were also shouted from rooftops nightly by opposition supporters during the 2009 post-election rallies. Protests that began after over the election have expanded to include criticism of the political system and government policies. Rallies resumed on Feb. 14 with Karrubi and Mousavi calling for a march in solidarity with demonstrators in other countries in the region following the ouster of Tunisian President Zine El Abidine Ben Ali and Egyptian President Hosni Mubarak. در پی فراخوان شورای هماهنگی راه سبز امید، روز سه‌شنبه تهران و چند شهر دیگر ایران از جمله شیراز، مشهد، اصفهان و تبریز شاهد تظاهرات گسترده مخالفان بود که در شعارهای خود از جمله خواستار آزادی میرحسین موسوی و مهدی کروبی شدند. بر اساس گزارش‌ها رسیده ده‌ها نفر در تظاهرات روز سه‌شنبه در ایران بازداشت شده‌اند. بر اساس گزارش‌های رسیده از ایران این تظاهرات حتی از تظاهرات روز ۲۵ بهمن ماه هم گسترده‌تر بوده است. شورای هماهنگی راه سبز امید، در اعتراض به حبس خانگی و سپس بازداشت میرحسین موسوی و مهدی کروبی، دو تن از رهبران مخالفان و همسرانشان، از مردم ایران خواسته‌ بود، در روزهای سه‌شنبه اسفند ماه سال جاری دست به تظاهرات بزنند. روز دوشنبه و در آستانه برگزاری تظاهرات روز ۱۰ اسفند ماه گزارش‌هایی درباره انتقال میرحسین موسوی، مهدی کروبی و همسرانشان به زندان حشمتیه تهران منتشر شده بود که واکنش تند گروه‌ها و شخصیت‌های منتقد جمهوری اسلامی را به دنبال داشت. در این میان تظاهرات روز سه‌شنبه در حالی برگزار شد که سخنگوی قوه قضائیه و دادستان کل جمهوری اسلامی نسبت به برگزاری هرگونه تجمع در روز سه‌شنبه هشدار داده و نیروهای امنیتی حضور گسترده‌ای در شهر‌های بزرگ و به ویژه تهران داشتند. به گفته شاهدان عینی معترضان در این روز از جمله در میدان فردوسی، خیابان انقلاب، چهارراه ولیعصر و تقاطع خیابان آزادی با خیابان‌های‌‌ نواب و بهبودی در تهران تجمع کرده و شعارهایی مانند «یاحسین، میرحسین» و «مرگ بر دیکتاتور» سر می‌دادند. همچنین گزارش‌هایی نیز از درگیری میان تظاهرکنندگان و نیروهای بسیجی و لباس‌شخصی در حد فاصل چهار راه ولیعصر و میدان ولیعصر منتشر شده است. برخی گزارش‌های دیگر و گفته‌های شاهدان عینی نیز حاکی از آن است که سایر نقاط شهر تهران مانند میدان ونک، میدان صادقیه و خیابان اسکندری نیز در روز سه‌شنبه شاهد تجمع‌ها و تظاهرات معترضان بوده است. شاهدان عینی همچنین از پرتاب گاز اشک‌آور توسط نیروهای امنیتی خبر داده و گفته‌اند در مناطق مرکزی شهر از جمله میدان انقلاب صدای تیراندازی شنیده شده است. با این همه تاکنون خبری درباره شمار مجروحان احتمالی تظاهرات روز سه‌شنبه منتشر نشده است. با این حال سایت اینترنتی سحام نیوز از بازداشت دست‌کم ۵۰ نفر در تهران و دست‌کم ۱۰ نفر در مشهد در جریان تظاهرات روز سه‌شنبه خبر داده است. گزارش‌های تایید نشده دیگر از بازداشت شمار زیادی از تظاهرکنندگان در شیراز حکایت دارد. تظاهرات روز سه‌شنبه علاوه بر تهران در چند شهر بزرگ دیگر از جمله شیراز، مشهد، اصفهان و تبریز نیز برگزار شده و گزارش‌هایی نیز درباره برگزاری تجمع‌های اعتراض‌آمیز در برخی شهرهای کوچک مانند سمنان و اسلام‌شهر در اطراف تهران هم منتشر شده است. تصاویر دریافتی از شیراز نمایانگر حضور پرتعداد معترضان در خیابان‌های این شهر است که شمار آنها هزاران نفر گزارش شده است. یک شاهد عینی در گفت و گو با رادیو فردا شمار جمعیت تظاهرکننده در خیابان‌های مرکزی شیراز را «بسیار زیاد» و به مراتب بیشتر از شمار تظاهرکنندگان در روز ۲۵ بهمن و اول اسفند اعلام کرده است. تظاهرکنندگان در شیراز از جمله شعار می‌دادند: «مبارک بن‌علی، نوبت سید‌علی». همچنین تصاویر منتشر شده در سایت‌های اینترنتی از حضور پرشمار تظاهرکنندگان در شهرهای مشهد و اصفهان حکایت می‌کند. به گفته یک شاهد عینی در مشهد، ‌خیابان راهنمایی این شهر عصر روز سه‌شنبه شاهد حضور انبوه تظاهرکنندگان بود که واکنش نیروهای امنیتی و لباس شخصی را به دنبال داشت. به گفته این شاهد عینی شمار زنان و دختران دانشجو شرکت کننده در تظاهرات روز سه‌شنبه در مشهد به مراتب بیشتر و با انگیزه‌تر از تظاهرات روز ۲۵ بهمن و یکم اسفند ماه بوده است. همزمان سایت‌ اینترنتی سحام‌نیوز، از برگزاری تجمعات گسترده‌ اعتراض‌آمیز در روز سه‌شنبه در اسلام‌شهر، از شهرهای حاشیه‌ای و فقیرنشین اطراف تهران، خبر داده است. بر اساس این گزارش مردم در جمع‌های پراکنده در این شهر شعارهای «مرگ بر دیکتاتور» و «موسوی و کروبی آزاد باید گردند» سر دادند و به گفته شاهدان عینی شماری از مردم و معترضان در اسلام‌شهر نیز بازداشت شده‌اند. همچنین گزارش‌ها حاکی از آن است که صدای تیراندازی نیز در اطراف دانشگاه آزاد اسلامشهر شنیده شده است. از سوی دیگر گزارش‌های دریافتی از ایران حاکی از آن است که درگیری‌ها و تجمع‌های روز سه‌شنبه حتی پس از تاریک شدن هوا نیز ادامه یافته و ماموران امنیتی به ویژه در نقاط مرکزی تهران با شلیک گاز اشک آور و ضرب و شتم، بر میزان خشونت خود در سرکوب معترضان افزوده‌اند. همچنین سه‌شنبه شب پس از پایان یافتن اعتراض‌های خیابانی در تهران در چند نقطه از تهران صدای «الله‌اکبر» و «مرگ بر دیکتاتور» معترضان از پشت بام‌ها شنیده شده است. It is clear that Monday's demonstrations in Iran came as a big surprise to both the government and the leaders of the opposition Green Movement. The fact that people were willing to come out onto the streets in defiance of the security forces showed just how much anger there still was against the government among some sections of the population. It also underlined the emptiness of the government's claims that the Green Movement was a spent force. Since the brutal suppression of the protests triggered by the disputed June 2009 presidential election, the authorities have maintained the line that there is no powerful opposition movement in Iran. As Monday's protests were unfolding across the country - and opposition websites were buzzing with news from the streets - state media were continuing to report that all was quiet. Crackdown But as Iranian MPs discussed the events in parliament on Tuesday, it was clear from the angry tone of the debate that they were seriously worried by what happened. For the first time, the Majlis heard calls not just for the prosecution of the two main opposition leaders - Mir Hossein Mousavi and Mehdi Karroubi - but even for them to be executed. It is hard to estimate exactly how many people joined in the demonstrations in Tehran and other cities on Monday. One reason is that the security forces did all they could to prevent people gathering in one place. In an echo of the protests on Tahrir (Liberation) Square in Cairo, the demonstrators in Tehran headed for the capital's Azadi (Freedom) Square. But security forces blocked many of the main roads leading into the city centre, meaning that the protests were dispersed. This is exactly the same strategy which the authorities have been using against the opposition as a whole over the past two years. By keeping the leaders of the Green Movement under virtual house arrest, and detaining many others, the authorities have prevented its mainly middle-class supporters from forming a broader network of support across different levels of society in Iran. They have also cracked down on trade union activists, students and women's rights groups in attempt to ensure that none of these could join forces and begin to turn the tide. Changing tactics Like their counterparts in Cairo and Tunis, the opposition supporters who have been out on the streets of Tehran this week are overwhelmingly members of the Facebook generation. * Lets put a face to each of those hundreds - possibly thousands - killed or arrested since the Iranian election. Since the disputed election on June 12 2009, the iranian authorities have detained hundreds of opposition supporters, journalists and protesters. There have also been a number of deaths. The interactive table shows the name & picture (if available) of the dead and detained. Guardian News is asking help from Iranians and journalists who have information on the dead or detained or have picture of those already listed. *** Visit IranianChurch.org for List of Killed and Imprisoned Iranian Christians since 1979. For three decades, the image of Ayatollah Ruhollah Khomeini arriving on Iranian soil to a tumultuous homecoming after 15 years in exile has been a centrepiece of Iran's revolutionary iconography. The prospect of revolutionary festivities is usually a cause for triumphalism among the Islamic republic's establishment. Instead, with the storm over Ahmadinejad's hotly disputed poll victory last June refusing to abate, it appears to be making them jumpy. That was evident last Sunday when Iran's ambassador to France, Mehdi Mir Abu Talebi, was involved in an unseemly scuffle with French police as he arrived on an annual pilgrimage to Neauphle-le-Château. Angered by the presence of anti-government demonstrators, Abu Talebi had to be restrained by police officers, after allegedly punching one of them in the chest, according to one account. He was said to have been released only after a colleague told police that he had diplomatic immunity. Such nervousness will be even more apparent this Thursday when the country's leaders gather to mark the revolution's final triumph, when the shah's armed forces declared themselves neutral and allowed Khomeini's followers to take control. Previous anniversaries have been marked by triumphant mass rallies in front of Tehran's Azadi monument. By contrast, this year's event threatens to be a bloody battleground witnessing a re-enactment of the extreme violence between security forces and opposition supporters that has marked several state-sanctioned public gatherings since Ahmadinejad's allegedly fraudulent election victory, which has been the trigger for a cycle of anti-regime protest. At least eight people – and possibly more – were killed when government forces fired on protesters in Tehran and other cities during the Shia Ashura ceremony in December. The scene for renewed confrontation was set last week when the two leaders of the opposition Green Movement, Mir Hossein Mousavi and Mehdi Karroubi, urged their followers to turn out in force on Thursday to protest against the brutal crackdown that has seen at least 80 people killed, thousands arrested and two executed for being part of what regime hardliners describe as "sedition". Another nine have been given death sentences after being convicted of moharebeh ("fighting against God"). خانواده‌های اعضای بازداشت شده نهضت آزادی ايران با ارسال نامه‌ای به آيت‌الله علی خامنه‌ای، رهبرجمهوری اسلامی، خواستار آزادی ابراهيم يزدی، دبير کل اين تشکل سياسی، و ساير زندانيان سياسی شدند. نامه به آيت‌الله خامنه‌ای به امضای خانواده‌های بازرگان، بسته‌نگار، توسلی، سحابی، شريعتی، صباغيان، صدر حاج‌سیدجوادی، طالقانی، غروی‌، يزدی و سايراعضای نهضت آزادی رسيده است. در این نامه گفته شده است که آزادی تمامی زندانيان سياسی، زمينه‌ساز جلب اعتماد عمومی و آماده شدن فضای سياسی کشور برای گفت‌وگو، همدلی و وفق ملی خواهد بود. امضاکنندگان نامه با انتقاد از ايجاد محدوديت، سلب آزادی و محبوس ساختن ابراهيم يزدی در حال بيماری و تأکيد بر ضرورت مراقبت‌های پزشکی‌ مستمر از او پس از عمل سرطان، اينگونه اقدامات را خلاف موازين قانونی و حقوق انسانی و موجب وهن نظام و حاکميت دانستند‌. خانواده‌های اعضای بازداشت شده نهضت آزادی در نامه خود با اشاره به سابقه فعاليت‌های ابراهيم يزدی و نيز انتقاد از نحوه بازداشت او، بر لزوم استفاده از سرمايه‌های معنوی کشور برای تربيت نسل جوان تأکيد کرده‌اند. آقای يزدی، ۷۸ ساله، روز هشتم دی ماه در منزل شخصی خود در ساعت سه بامداد بازداشت شد و بر اساس برخی گزارش‌ها برای منحل اعلام کردن نهضت آزادی تحت فشار است. پيشتر نيز وزارت اطلاعات جمهوری اسلامی ايران با احضار پنج عضو دفتر سياسی نهضت آزادی از آنها خواسته بود که تمامی فعاليت‌های اين تشکل سياسی متوقف شود. اين دومين بازداشت دبيرکل نهضت آزادی پس از انتخابات رياست جمهوری ۲۲ خرداد است. به گفته خانواده ابراهيم يزدی، او مبتلا به سرطان پروستات است و نياز به مراقبت دائم پزشک دارد. اين فعال سياسی پيشتر وزير خارجه دولت موقت مهدی بازرگان، دبير کل سابق نهضت آزادی، بوده است. Since the disputed election last June, Ahmadinejad's government has sought different ways to further crack down on the internet in Iran. Now, access to almost all reformist websites is blocked, including those of the reformist candidates, Mir Hossein Mousavi and Mehdi Karoubi. Last week Iran launched a national webmail service via iran.ir, intended to replace free foreign webmail services with a domestic one that is easier to control. All government employees are being urged to use it instead of foreign webmail providers. According to the Iranian official figures, 95% of Iranians currently use Yahoo Mail, Gmail and Hotmail accounts. Human rights activists in Iran fear that the national webmail service is part of a bigger plan to localise the internet within Iran's borders although many believe it is too late for Iran to do so effectively. Recently, officials have blocked access to Google Translate, which has provided English to Persian, Persian to English service since June. But, as has happened in China, is filtering Google the next step? Although iran.ir does not yet have the capacity to provide free webmail services for everyone, it will do so shortly. Gmail is reportedly blocked in some parts of Iran and its audio and video attachments are impossible to download. At least 5m websites are filtered in Iran, but for clever users, filtering is pointless; thousands of proxy sites distribute the net's wider content to blogs or email addresses. But even these users have so far been unable to bypass the block on Gmail attachments. TEHRAN, Iran – Iran's supreme leader accused U.S. Secretary of State Hillary Rodham Clinton on Wednesday of spreading "lies" against Iran during her tour of Arab states in the Persian Gulf. Ayatollah Ali Khamenei claimed that the U.S. seeks to frighten Arab states with the specter of Iran in order to sell them expensive weapons systems. "Now, the Americans, once again, have dispatched their agent as a saleswoman to the Persian Gulf to spread lies," state TV quoted Khamenei as saying. Khamenei didn't mention Clinton by name but he was referring to her tour of the region. Clinton told an audience at a Saudi women's college in Jiddah, Saudi Arabia on Tuesday that it is the responsibility of Iran's neighbors to ensure it does not get nuclear weapons. She also warned that Iran was sliding into a military dictatorship. گزارش ها از ایران حاکیست با نزدیک شدن به مراسم سالگرد انقلاب در ۲۲ بهمن، موج جدیدی از بازداشت ها در این کشور آغاز شده و دامنه بازداشت ها علاوه بر روزنامه نگاران و فعالان سیاسی به افراد عادی و کسانی که سابقه فعالیت های سیاسی نداشته اند هم کشیده شده است. گفته می شود بخشی از این افراد کسانی بوده اند که در تجمعات اعتراضی ماههای اخیر حضور داشته اند و یا در مورد این تجمعات به دوستان و آشنایان خود ایمیل یا پیامک تلفن همراه ارسال کرده بودند. این افراد که اکنون بعضی از آنها آزاد شده اند می گویند در بازجویی های انجام شده از آنها در مورد همین ایمیل ها و پیامک ها سئوالاتی شده است. سراج الدین میردامادی، روزنامه نگار در پاریس کنترل ایمیل ها و پیامک های تلفن همراه را یکی از شگردهای دستگاههای امنیتی، نظامی و اطلاعاتی حکومت ایران می داند که در ماههای اخیر برای جلوگیری از افزایش و گسترش اعتراضات و همچنین مانع شدن از ارتباط گیری هسته های اجتماعی در آستانه مراسم ۲۲ بهمن به کار گرفته اند. خبر بازداشت افراد در ارتباط با ارسال ایمیل ها و پیامک هایی در مورد اعتراضات پس از انتخابات ریاست جمهوری اخیر در ایران در حالی منتشر می شود که سخنگوی کمیسیون قضایی و حقوقی مجلس در گفتگو با خبرگزاری ایسنا این موضوع را مصداق ورود به حریم خصوصی افراد و خلاف قانون دانسته است. TEHRAN (AFP) – Iran said on Sunday its Internet connections will remain slow this week due to technical problems, ahead of anticipated protests by opposition supporters. Connections have been slow since last week and some email accounts have been unavailable for several hours each day. "The cause of the reduced Internet speed in recent days is that part of the fibre-optic network is damaged," Communications Minister Reza Taghipour told Iran's state broadcaster. "The breakage will be repaired by next week and the Internet speed will be back to normal," he added. The Iranian week runs from Saturday to Friday. Taghipour said the undersea optic fibre across the Gulf between the Iranian port of Jask and Fujairah in the United Arab Emirates had been damaged due to shipping traffic and anchoring. He also acknowledged that text messaging in Iran had been disrupted, blaming it on "changing software." Iran's anti-government protesters have effectively used the Internet and SMS services to organise rallies and spread news and pictures of the demonstrations. ۱- پروژه هاى سرنگونى رژیم: آیت الله خمینى در دوران انقلاب و ورود به ایران در بهشت زهرا اعلام کرد: فرض کنیم قانون اساسى مشروطه را پدران ما در آزادى کامل نوشته اند. حق تعیین سرنوشت آنها- یعنى نگارش قانون اساسى و تعیین نوع رژیم- محدود به دوران زندگى خودشان بود. آنها حق نداشتند درباره ى سرنوشت ما تصمیم گیرى کنند. نسل کنونى (سال ۱۳۵۷) بر مبناى حق تعیین سرنوشت، قانون اساسى جدیدى تهیه خواهد کرد که در آن نوع رژیم سیاسى مشخص خواهد شد. اگر این استدلال پذیرفتنى باشد، نسل کنونى هم حق دارد قانون اساسى جدیدى برسازد و در آن نوع رژیم سیاسى را تعیین کند. شعارها و اتهاماتى چون براندازى نرم، انقلاب مخملى و غیره، نافى این حق نیست. در این چارچوب به عنوان یک شهروند ایرانى، قانون اساسى جمهورى اسلامى را قبول نداشته و قانون اساسى دموکراتیک را حق خود و نسل کنونى به شمار مى آورم. اما آن چه در این بخش گفته خواهد شد، نگاهى است به پروژه هاى سرنگونى رژیم، پیامدهاى منطقى- عملى و نتایخ ناخواسته ى آن پروژه ها. مدافعان سرنگونى رژیم جمهورى اسلامى و نابودى آن، سه راه متفاوت، یا مکمل یکدیگر، را پیشنهاد مى کنند. ۱-۱-- انقلاب : رژیم جمهورى اسلامى، به عنوان یک رژیم خودکامه ى سرکوبگر، رژیمى اصلاح ناپذیر است. از این رو، تنها راه پیش رو، انقلاب علیه این رژیم است. این مدعا، دو معناى متفاوت مى تواند داشته باشد. اول- اگر رژیمى تمامى راه هاى تحول مسالمت آمیز را مسدود سازد، به طور ضرورى و حتمى انقلاب صورت خواهد گرفت. دوم- تنها راه ایجاد تغییر و تحول، کنش انقلابى به منظور سرنگونى رژیم است. مطابق معناى اول، طومار نظام اصلاح ناپذیر به طور ضرورى از راه انقلاب برچیده خواهد شد. اما مطابق معناى دوم، تغییر رژیم اصلاح ناپذیر، نتیجه توافق نظرى مخالفان بر سر انقلاب و عمل انقلابى همه ى آنان است. تا حدى که من اطلاع دارم، مبلغان و مدافعان انقلاب و فروپاشى رژیم، مدافع معناى دوم اند. یعنى مردم ایران را دعوت مى کنند تا رژیم جمهورى اسلامى را سرنگون سازند. یکی از فرماندهان سپاه پاسداران ایران گفته است اگر کسی در روز ۲۲ بهمن اعتراض کند از مردم ایران نیست و "با جرات می گوییم که عامل بیگانه است". حسین همدانی، فرمانده سپاه محمد رسول الله تهران، روز شنبه ۱۰ بهمن گفت مردم ایران در راهپیمایی روز نهم دی (که حکومت ایران برای اعتراض به آنچه هتک حرمت در روز عاشورا می خواند، برگزار کرده بود) اتمام حجت کردند و خواستار ختم غائله بودند. آقای همدانی گفت: "ما به هیچ عنوان اجازه نمی دهیم چیزی به عنوان موج سبز خودی نشان بدهد... ما مطمئن هستیم کسانی که تا پیش از ۹ دی متوجه نبودند و تشخیص نمی دادند و فکر می کردند می شود حرکتی انجام داد، در روز ۹ دی متوجه شده اند روز ۲۲ بهمن روز اعتراض نیست، بلکه روز یکپارچگی است." این در حالی است که میرحسین موسوی و مهدی کروبی، از رهبران اصلی مخالفان، در دیداری که روز شنبه در خانه آقای کروبی داشتند ضمن محکوم کردن اعدام های اخیر، از مردم ایران خواستند در راهپیمایی روز ۲۲ بهمن شرکت گسترده داشته باشند. از زمان آغاز اعتراضات بعد از انتخابات ریاست جمهوری ۲۲ خرداد، معترضان از روزهایی که مراسم رسمی در آنها برگزار می شود (از جمله نماز جمعه، راهپیمایی روز قدس و راهپیمایی روز ۱۳ آبان) برای ترتیب دادن تجمع های گسترده اعتراضی استفاده کرده اند و پیش بینی می شود در راهپیمایی ۲۲ بهمن هم اتفاق مشابهی بیفتد. البته آقای همدانی گفته است: "اگر بخشی از جامعه ما اعتراضی داشته که بحق هم هست که اعتراضی به برخی رفتارهای دولتمردان داشته باشند، مطمئنیم روز ۲۲ بهمن چنین کاری نخواهند کرد." آقای همدانی در ادامه تاکید کرد نیروهای سپاه و بسیج در روز ۲۲ بهمن با "هر صدا، رنگ و حرکتی غیر از صدای ملت ایران و انقلاب اسلامی... به شدت برخورد خواهیم کرد." Iran has put 16 people on trial after anti-government protests in December, when eight people died in some of the most violent clashes seen in months. Five of the defendants are charged with "waging war against God" while the others are accused of public order and national security offences. They were all arrested over protests on 27 December when Shia Muslims gathered for the religious festival of Ashura. Street protests have recurred in Iran since the disputed election in June. Hardline leader Mahmoud Ahmadinejad was re-elected for a second term in a poll marred by allegations of fraud. Hundreds of people were detained in the immediate aftermath of the Ashura Day protests. On Thursday, Iran reportedly executed two men arrested during the unrest which followed the June election. The executions are believed to be the first related to the protests. Reporting Saturday's trial, Iran's state news agency said five defendants were accused of "waging war against God" and being "corrupt on earth" - both crimes punishable by death under the Iranian legal system. DUBAI, United Arab Emirates – The Human Rights Watch says Iran's post-election unrest is a "full-blown human rights crisis" and calls on Tehran to free government critics detained during the crackdown. The New York-based watchdog says the "systematic and brutal targeting" of demonstrators and dissidents by security forces after the June presidential elections was an attempt "to silence voices of dissent." Thousands of peaceful protesters, including students, lawyers and prominent human rights activists have been detained in a crackdown that has turned into "a human rights disaster," the watchdog said in its annual report on human rights violations and abuses worldwide. ديده بان حقوق بشر، در گزارشى كه روز يكشنبه انتشار داد اعلام کرد كه وضعيت حقوق بشر در كشورهاى حاشیه خليج فارس بحرانى شده و دولت هاى خاورميانه، طى سال گذشته ميلادى، مسئول يكسرى از موارد آشكار نقض حقوق بشر و از جمله، آزار مردم و حمله عليه فعالان مدنى و سازمان هایی بوده اند كه مدارك و شواهد نقض حقوق بشر را گردآورى مى كنند. جو استورك، معاون بخش خاورميانه و شمال آفريقا در سازمان آمريكایی «ديده بان حقوق بشر»، در يك كنفرانس مطبوعاتى در دوبى، فصل هایی از گزارش سالانه اين سازمان در زمينۀ نقض حقوق بشر در امارات متحدۀ عربى، بحرين، ايران و عراق را ارائه كرد. در این گزارش گفته مى شود که مجموعه اى از تنش هاى سياسى و ركود اقتصادى، موجب تشديد نقض آشكار حقوق بشر طى سال ۲۰۰۹ ميلادى شد كه در برخى موارد به تناسب، به مرحلۀ بحرانى رسيد و اين دولت ها، به جاى سركوب مردمانى كه در پى حقوق خود هستند، نيازمند جلوگيرى از سركوب ها، تجاوزها و تبعيض ها است. DUBAI, United Arab Emirates – A rights group is demanding Iran release 33 mothers detained during their weekly memorial vigils for their children killed in the nation's ongoing violence. The International Campaign for Human Rights in Iran says that nine of the jailed woman received emergency medical treatment after they were rounded up by security forces Saturday in a Tehran park where they hold their demonstrations. The group's statement, issued late Sunday, says the women suffered from "various illnesses." Iranian authorities have not commented on the reported detentions. The women are part of a "mourning mothers" gathering held by women whose children have been killed in unrest since disputed elections in June. (CNN) -- Iranian authorities confiscated the 2003 Nobel Peace Prize given to human rights activist Shirin Ebadi, Norway said Thursday. "The medal and the diploma have been removed from Dr. Ebadi's bank box, together with other personal items. Such an act leaves us feeling shock and disbelief," Norwegian Foreign Minister Jonas Gahr Store said in a written statement. Norway did not explain how it had learned of the alleged confiscation, and there was no immediate reaction from Iran. Norway's Ministry of Foreign Affairs said in a written statement that it "has reacted strongly" and summoned the Iranian charge d'affaires on Wednesday afternoon to protest the move. During the meeting with the Iranian charge d'affaires, State Secretary Gry Larsen also expressed "grave concern" about how Ebadi's husband has allegedly been treated. "Earlier this autumn, he [Ebadi's husband] was arrested in Tehran and severely beaten. His pension has been stopped and his bank account has been frozen," the statement from Norway said. تصمیمی که گرفتم، تصمیم سختی بود؛ یعنی در طول حوادث پس از انتخابات، برخوردهای انجام شده با مردم که در روز عاشورا به اوج خود رسید، من را به فکر فرو ‌می‌برد. حکومتی که ادعای آن را داشت که با انقلاب مردمی پیروز شده است، اکنون در مقابل مردم ایستاده و در روز عاشورا، مردم را مورد ضرب و شتم قرار می‌دهد. پس از دیدن این اتفاقات استعفای خود را به صورت علنی به خبرگزاری‌ها اعلام کردم. چون قبلا استعفا داده بودم و قصد برگشت به ایران را داشتم. به هرصورت استعفایم راعلنی کردم که حداقل برای مردم مشخص شود در داخل سیستم حاکم جمهوری اسلامی هم کسانی هستند که از این برخوردها ناراضی هستند. Tehran, Iran (CNN) -- Several people were killed and more than 300 were arrested in anti-government protests in Tehran Sunday, Iran's Deputy Police Chief Ahmad Reza Radan said on state television station IRINN. The toll was the result of clashes that broke out between demonstrators and security forces as large crowds gathered for Ashura, a major religious observance. Five people were reported killed in the fighting, Iranian state-run Press TV said late Sunday. A French government statement put the number of fatalities at eight. With tight restrictions on international media, CNN could not independently verify the casualties. Without giving an exact number of casualties, Radan said those killed included one person who fell off a bridge and two others who were killed in a car accident during the protests. One of the victims was killed by a bullet, Radan said. But "considering the fact that the police did not use firearms, this incident is extremely suspicious, and is being investigated," he said. The Web site of opposition leader Mir Hossein Mousavi reported that Mousavi's nephew, Seyed Ali Mousavi, was killed in the demonstrations around noon local time Sunday by a gunshot to the heart. Clashes between anti-government protesters and police in Tehran have left at least four people dead. People in Tehran have sent footage from the protests to the BBC and video-sharing sites Amateur footage shot in Tehran shows protesters cornering members of the Basij militia and taunting them. The protesters can also be heard telling the militia to chant and denounce the Supreme Leader before they let them go. The Basij militia is an Iranian volunteer force of Islamic government loyalists which is often called on to the streets at times of crisis to dispel dissent. 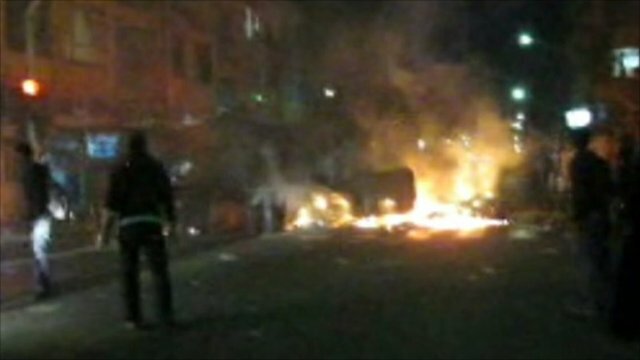 After a clash between protesters and the Basij security forces, the crowds set alight motorbikes of retreating forces. This confrontation is on Enghelab Street, near Hafez Bridge in central Tehran. The protesters are shouting "Don't be frightened, we are all together". Large disturbances took place on exactly this spot 30 years ago, on the traditional Shia day of mourning, Ashura, in 1979, the year of the revolution. News of chaos and fierce clashes continue to pour from Tehran, with some on the Web describing the city as a war zone. Clouds of black smoke are billowing into the sky in the Iranian capital from tear gas canisters fired by police while tens of thousands of opposition supporters are continuing to clash with riot-clad security forces, allegedly setting afire trash cans and police cars. Police helicopters continue to circle areas of central Tehran where defiant crowds of protesters have gathered, as seen in this video below. "People in Tehran [are] saying this is not a Demo. This is uprising!" Opposition protesters seem to be growing increasingly daring despite the reports of several fatalities and injuries during today's protests -- though Iranian police deny those reports. In the following footage, a car said to be a police vehicle has been tipped to its side and set ablaze as protesters wearing masks chant "Allah Akbar" (God is great). Police and security forces have been met with fierce resistance by opposition protesters in some areas of the capital. It is said they've lost control in certain parts and been pushed away by crowds of protesters. دادگاه انقلاب اسلامی در تهران برای محمدعلی ابطحی و محمد عطریانفر که از جمله سرشناس ترین بازداشت شدگاه حوادث پس از انتخاب در ایران بودند، حکم اولیه مجازات صادر کرده است. رضا موسوی، برادر همسر آقای ابطحی روز شنبه ۳۰ آبان (۲۱ نوامبر) به بی بی سی فارسی گفت که دادگاه، آقای ابطحی را به تحمل ۶ سال حبس محکوم کرده است. احکام دادگاه های بدوی در ایران قابل تجدیدنظر خواهی است. آقای موسوی گفت: "حدود ساعت ۱۰ صبح امروز، ۵ مأمور که ظاهرا مأموران دادستانی بودند به همراه آقای ابطحی به منزل او رفتند و چند ساعتی در منزل مستقر بودند و اجازه ورود به کسی نمی دادند. از آنجا که قرار بود دادگاه حکم ایشان را ابلاغ کند، خانم ایشان به دادگاه رفته بود. آقای ابطحی هم بعدا از منزل به دادگاه منتقل شد و در آنجا حکم ایشان مبنی بر تحمل ۶ سال زندان ابلاغ شد". به گفته آقای موسوی، آقای ابطحی مجددا به زندان اوین منتقل شده و به وکیل و اعضای خانواده او گفته شده است که باید فردا برای پیگیری کار او به دادگاه مراجعه کنند و "ببینند که آیا می شود قرار ایشان را تا زمان قطعی شدن حکم، به وثیقه تبدیل کرد یا خیر". On June 21, reporter Maziar Bahari was rousted out of bed and taken to Tehran's notorious Evin prison—accused of being a spy for the CIA, MI6, Mossad…and NEWSWEEK. This is the story of his captivity—and of an Iran whose rampant paranoia underpins an ever more fractured regime. -- Evin Prison, June 21, 2009 (around 10 a.m.) The interrogator sat me in a wooden chair. It had a writing arm, like the chair I'd had in primary school. He ordered me to look down, even though I was already blindfolded: "Never look up, Mr. Bahari. While you are here—and we don't know how long you're going to be here—never look up." All I could see from under the blindfold was the interrogator's black leather slippers. They worried me. He had settled in for a long session. جمعی از فارغ‌التحصیلان دانشگاه صنعتی شریف با انتشار بیانیه‌ای، خواستار آزادی حجت‌الله شریفی و نفیسه زارع‌کهن شدند. حجت شریفی، عضو سابق شورای مركزی سازمان ادوار تحکیم وحدت و نفیسه زارع كهن، عضو سابق شورای سیاستگذاری این سازمان، روز ۱۳ آبان دستگیر شدند و در حال حاضر در بازداشت به سر می‌برند. ۱۴۳ تن از فارغ‌التحصیلان دانشگاه صنعتی شریف با امضای این بیانیه، بازداشت این زوج و سایر فعالان دانشجویی را «غیرقانونی» دانسته و نسبت به آن اعتراض کرده‌اند. آنها از مقام‌های قضایی ایران خواسته‌اند که فعالان دانشجویی زندانی را بدون «هیچ قید و شرطی» آزاد کنند. UNITED NATIONS, Nov. 21 (UPI) -- A U.N. committee says Iran should release political prisoners arrested during protests over the country's disputed presidential election in June. The General Assembly's Human Rights Committee issued a non-binding resolution Friday blasting Iran's crackdown on protesters, as well as repeating its ongoing criticism of Tehran's use of torture and its rising numbers of executions, the BBC reported. The resolution reportedly urged Iran to abandon its policy of persecuting political opponents and called for the release of those imprisoned for their political views. "The United States welcomes the resolution passed today by the United Nations calling upon the government of Iran to respect its human rights obligations fully," U.S. State Department spokesman Robert Wood said in a statement. "This resolution demonstrates that the international community is deeply concerned over the deteriorating human rights situation in Iran and the government's failure to uphold its obligations under its own constitution and international human rights law." غلامحسين محسنی اژه ای ، دادستان کل کشور، روز پنجشنبه گفته است: قوه قضائيه مصمم است تا با تکرار هرگونه ناآرامی تازه توسط معترضان به نتيجه انتخابات رياست جمهوری ايران «به صورت قاطع و بازدارنده برخورد» کند. به گزارش واحد مرکزی خبر، آقای اژه ای با اشاره به آنچه که «اغتشاشات پس از انتخابات دهم رياست جمهوری» خواند، گفت: «دستگاه قضايی با تکرار اين گونه موارد، به صورت قاطع و بازدارنده برخورد خواهد کرد.» به دنبال اعلام نتايج انتخابات رياست جمهوری ايران در ۲۳ خرداد ماه، معترضان با اعلام اينکه در انتخابات دهم رياست جمهوری « تخلف و تقلب های وسيعی» صورت گرفته است خواهان ابطال آن شدند ولی تظاهرات مسالمت آميز آنها با خشونت بی سابقه پليس و نيروهای بسيجی سرکوب شد. Tehran, Iran (CNN) -- Iran has announced it has sentenced five people to death and another 81 to prison terms of six months to 15 years for their roles in the protests that followed the country's disputed presidential elections. The five who received death sentences on Tuesday were convicted of membership in terrorist groups and carrying out bombings across Iran, the Tehran judiciary said in a statement reported by state media. The others were found guilty on various charges, including acting against the national interest, disturbing the peace and destroying public property. دختر داريوش وپروانه فروهر اعلام كرد، مراسم سالگرد قتل پدر و مادرش عليرغم اعلام ممنوعيت آن از سوى مقام‌هاى امنيتى جمهورى اسلامى ایران در منزل فروهرها برگزار خواهد شد. پرستو فروهر دختر داريوش و پروانه فروهر روز شنبه به راديو فردا گفت، در روز يكشنبه اول آذر ماه و در سالگرد قتل پدر و مادرش در سال ۱۳۷۷ طبق روال هر سال مراسم سالگرد آنها را در منزل برگزار خواهد كرد. داريوش فروهر، رهبر حزب ملت ايران و همسرش پروانه اسكندرى، در اول آذرماه سال ۱۳۷۷ و در دوره رياست جمهورى محمد خاتمى، در منزلشان بر اثر ضربات چاقو كشته شدند. چندى بعد از اين رويداد و كشته شدن چند تن از نويسندگان و روشنفكران كه به «قتل‌هاى زنجيره‌اى» مشهور شده است، مقام‌هاى امنيتى جمهورى اسلامى ایران اعلام كردند، «عناصر خودسر و كج‌انديش» در وزارت اطلاعات را مسئول اين قتل‌ها اعلام كردند. هر چند در سال‌هاى گذشته مقام‌هاى امنيتى از برگزارى مراسم سالگرد قتل داريوش و پروانه فروهر جلوگيرى كرده بودند، با اين حال پرستو وآرش فروهر، فرزندان فروهرها در آستانه سالگرد قتل پدر و مادرشان با انتشار اطلاعيه‌‌اى اعلام كرده بودند، مراسم سالگرد آنها را در منزلشان واقع در خيابان هدايت برگزار خواهند كرد. 11/18/2009 - Wednesday - Tehran - Clinton: Iran unrest death sentences "distressing"
TEHRAN (Reuters) – A court has sentenced three people to death over street unrest that erupted after Iran's disputed election in June and links to exiled opposition groups, an Iranian news agency reported Saturday. ISNA news agency, citing the head of the publication relations office of Tehran provincial court, did not identify those condemned, giving only their initials. It was the first official statement of death sentences in connection with the presidential poll, which the opposition says was rigged to secure hardline President Mahmoud Ahmadinejad's re-election, and the huge opposition protests that followed. The authorities have rejected vote fraud charges and portrayed the protests as a foreign-backed bid to undermine the Islamic Republic. "The execution sentences were handed down because of involvement in post-election developments and affiliation with the Iran monarchical association and the PMOI," the official, Zahid Bashiri-Rad, said. A group of former Iranian MPs has appealed to a powerful clerical panel to investigate if Supreme Leader Ayatollah Ali Khamenei is fit to rule. 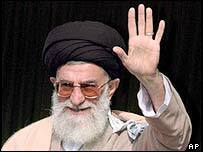 The call was made to the Assembly of Experts, which under Iranian law has the power to remove the supreme leader. In a letter, the group denounces the crackdown on protests after June's disputed poll and the resulting trials. Meanwhile a senior cleric has said a reformist leader should be prosecuted for alleging protesters had been raped. Ayatollah Ahmad Khatami said defeated election candidate Mehdi Karroubi's remarks boosted Iran's enemies, particularly the US and Israel. Mr Karroubi has alleged that some protesters - male and female - were raped while detained in prison. He has also said that some were tortured to death. واشنگتن پست زير عنوان "درخواست اصلاح طلبان برای تحقيق در باره رهبرارشد ايران" می نويسد يگ گروه از قانونگذاران پيشين اصلاح طلب ازيک تشکيلات مذهبی قدرتمند در ايران خواستار تحقيق در باره صلاحيت حکمرانی آيت الله علی خامنه ای رهبر ارشد شده اند، که يک زورآزمائی بی سابقه با قدرتمندترين فرد کشور در مورد سرکوبی های پس از انتخابات است. واشنگتن پست می نويسد اين درخواست هنگامی مطرح ميشود که بحث و جدل در باره اتهامات حاکی ازشکنجه معترضين توقيف شده در جريان سرکوبی ها شدت گرفته است. آخوندهای تندرو در نقاط مختلف کشور خواستار تعقيب رهبر ارشد اصلاح طلبی شده اند که مدعی است زندانبانان به بعضی از توقيف شدگان تجاوز کرده اند. واشنگتن پست می نويسد درخواست قانونگذاران پيشين اصلاح طلب به مجلس خبرگان داده شده است که تشکيلاتی مذهبی است، و بر اساس قوانين ايران از قدرت تعيين رهبر ارشد، و در تئوری، از قدرت برکناری او برخوردار است- هرچند که دراين زمينه هيچگاه اقدامی انجام نداده است. . واشنگتن پست می نويسد حتی اگر درخواست ناديده گرفته شود، و سمبوليک باشد، اين واضح ترين زورآزمائی با خامنه ای درجريان تلاطمی است که ايران را پس ازانتخابات مورد اختلاف رياست جمهوری به آشفتگی کشانده است. اين درخواست در هم شکننده تابوئی بزرگ در ميان طبقات سياسی ايران برای هدف گرفتن علنی خامنه ای است، که موضع او در راس تشکيلات سياسی مذهبی هيچگاه زير سئوال نرفته بود. Mehdi Karroubi, one of the defeated candidates in Iran's disputed presidential election, has angered hardliners by alleging that male and female protesters were raped by their jailers in the crackdown following the vote. One hardline cleric has called for Karroubi, who came third in the election, to be prosecuted for making the claims. But undaunted, Karroubi has gone further, saying some detainees were tortured to death. He also compared the treatment of prisoners with that at the notorious Abu Ghraib prison in Iraq. Some detainees were "forced to go naked, crawl on their hands and knees like animals, with prison guards riding on their backs". Others were forced to lie "naked, on top of one another," Karroubi said in a statement tonight. UNITED NATIONS (CNN) -- Three independent United Nations human rights experts have accused Iran of torturing confessions from detainees charged with fomenting political unrest, the international organization said Thursday. "No judicial system can consider as valid a confession obtained as a result of harsh interrogations or under torture," said Manfred Nowak, who is the U.N. special rapporteur on torture. The treatment of detainees at Iran's prisons has increasingly become a divisive issue within Iran's Islamic leadership, as reformists continue to accuse the hardline government of allowing abuse and torture in attempts to coerce false confessions. Iranian officials have denied the allegations. "These confessions for alleged crimes such as threats against national security and treason must not, under any circumstances, be admitted as evidence by the Revolutionary Court," said El Hadji Malick Sow, vice chairman of the U.N.'s working group on arbitrary detention. The United Nations, in a news release, said the statements also reflect the position of Margaret Sekaggya, special U.N. rapporteur on the situation of human rights defenders. مجمع نمايندگان ادوار مجلس، از تشکل های اصلاح طلب، در نامه به اکبر هاشمی رفسنجانی، می گوید از آنجا که بسياری از اقدامات اخير نهادهای زير نظر آيت الله علی خامنه ای، رهبر جمهوری اسلامی اتفاق افتاده است، مجلس خبرگان رهبری باید «وفق قانونی» اصل ۱۱۱ قانون اساسی را بررسی کند. اصل ۱۱۱ قانون اساسی ايران می گويد: «هر گاه رهبر از انجام وظايف قانونی خود ناتوان شود يا فاقد يکی از شرايط مذکور در اصول پنجم و يکصد و نهم گردد، يا معلوم شود از آغاز فاقد بعضی از شرايط بوده است، از مقام خود بر کنار خواهد شد» و تشخيص اين امر بر عهده مجلس خبرگان رهبری است. مجمع ادوار نمايندگان مجلس، که متشکل از نمايندگان سابق مجلس شورای اسلامی است، در نامه خود از رويکرد نهادهای نظامی و امنيتی جمهوری اسلامی در جريان اعتراضات پس از انتخابات رياست جمهوری انتقاد کرده است. مجمع ادوار نمايندگان بررسی اقدامات نيروهای امنيتی و نظامی زیر نظر رهبر ایران در جريان اعتراضات اخير را مهم دانسته و تاکيد کرده است که قانون اساسی جمهوری اسلامی ايران می تواند محور احيا اعتماد عمومی باشد.